With a stay at Hotel Sahara in Essaouira (Medina), you'll be within a 5-minute walk of Essaouira Beach and Mohammed Ben Abdallah Museum. 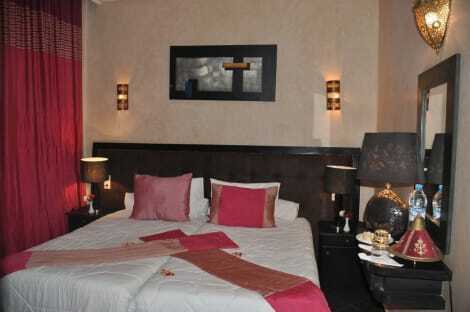 This spa hotel is 0.1 mi (0.2 km) from Skala de la Ville and 0.2 mi (0.3 km) from Place Moulay el Hassan. This guesthouse has 2 floors in 1 building and offers designated smoking areas. Recreational activities include hiking/biking trails nearby and windsurfing nearby. Ideally located in Essaouira, this enchanting hotel offers the perfect base from which to explore the essence and intrigue of the area. Guests will find themselves in the perfect setting in which to uncover the historic and cultural delights of the vicinity. This charming hotel is just a 10 minutes' walking distance from the historic centre of the Medina, where guests can explore the meandering streets and the sweeping bay, where a host of recreational activities can be enjoyed. The hotel enjoys an attractive architectural style, utilising traditional design and decor to blend effortlessly with its surroundings. The guest rooms are elegantly appointed, featuring soothing tones and intriguing designs. Guests will be impressed by the facilities that the complex has to offer, with something to meet the needs of every type of traveller. With a stay at Riad Tamayourt in Essaouira, you'll be near the beach, within a 15-minute drive of Essaouira Beach and Bordj el Berod. This riad is 4.9 mi (7.9 km) from Skala de la Ville and 4.9 mi (7.9 km) from Mohammed Ben Abdallah Museum.